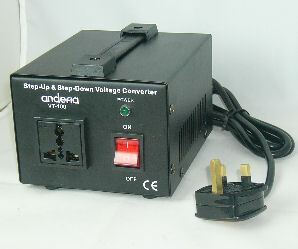 Andefia VT-100 Step Down and Step Up Voltage Converter Ref: VT100. * Can also be used as a Step Up converter. A high quality voltage converter that converts 220 - 240V AC mains power to 110 - 120V AC 50/60Hz. 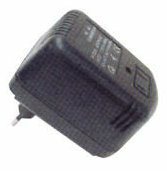 This voltage converter allows the use of US electrical equipment with 2 pin or 3 pin plugs in the UK. Has its own fuse protection. Rated for use with devices up to 45 Watts - great for battery chargers and low wattage items - do not attempt to use this item with hair straighteners or other high wattage equipment or indeed anything that produces heat. Despite the image below (which is the European version) the version we sell has a molded UK 3 pin plug. Not suitable for use with heat producing equipment such as hair straighteners or hair dryers. Also, not suitable for most TVs which have a high wattage surge when switched on. IF THIS MODEL IS OUT OF STOCK WE WILL SUPPLY A DIRECT EQUIVALENT. A high quality voltage converter that converts 220 - 240V AC mains power to 110 - 120V AC 50/60Hz. This voltage converter allows the use of US electrical equipment with 2 pin plugs in the UK. The HQ 75 Watt Step Down Voltage Converter has its own fuse protection. Rated for use with devices up to 75 Watts - great for battery chargers and low wattage items - do not attempt to use this item with hair straighteners or other high wattage equipment or indeed anything that produces heat. VC-300W 300 Watt Voltage Converter Ref: VC-300W. Medium duty voltage converter. Converts 220 - 240V AC mains power to 110 - 120V AC 50/60Hz and 300 Watts. Allows use of US electrical equipment with 2 or 3 pin plugs in the UK. Has fuse protection. Powerful enough to run a portable TV or a laptop computer. A premium voltage converter. 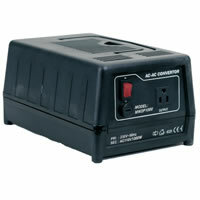 Step Down Converter (500 Watts) Ref: 500w. Heavy duty voltage converter. 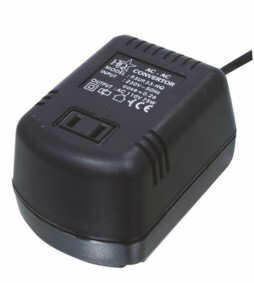 Converts 220 - 240V AC mains power to 110 - 120V AC 50/60Hz and 500VA (500 Watts). 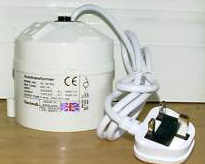 Allows use of US electrical equipment with 2 or 3 pin plugs in the UK. Has two sockets. Has its own anti surge fuse protection and the voltage converter's casing is flame retarding. MW2P1000 800 Watt Step-Down Voltage Converter Ref: MW2P1000. 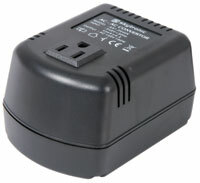 Voltage Conversion Company MEE-112 1000 W Ref: MEE-112. The Voltage Conversion Company MEE-112 has two universal output sockets, allowing you to power two products at once. The Voltage Conversion Company MEE-112 converts 220 - 240V AC mains power to 110 - 120V AC 50/60Hz. Rated up to 1000 Watts. 1500W STEP UP AND DOWN VOLTAGE TRANSFORMERS Ref: VC1500W. 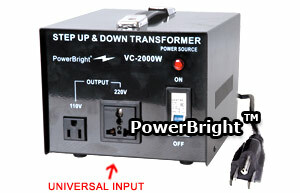 VC2000W STEP UP AND DOWN VOLTAGE TRANSFORMERS Ref: VC2000W. 220-240 volt to 110-120 volt AND from 110-120 volt to 220-240 volt. 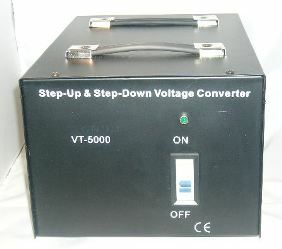 Heavy Duty Step Down Converter (3000 Watts) Ref: VC3000. 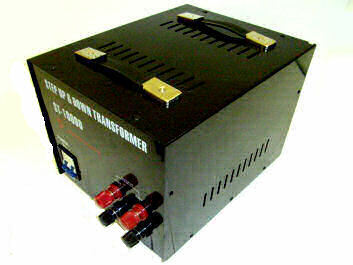 Our biggest heavy duty desktop voltage converter, capable of powering industrial grade equipment. Converts 220 - 240V AC mains power to 110 - 120V AC 50/60Hz. 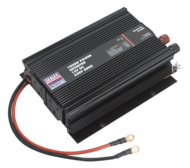 Rated up to 3000 Watts. Allows use of US electrical equipment with 2 or 3 pin plugs in the UK. Has fuse protection. 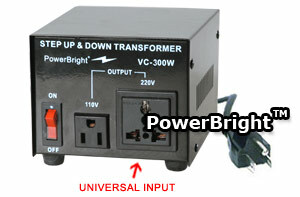 We sell this primarily as a Step Down voltage converter as it is fitted with a UK 3 pin plug. However, all Power Bright converters are very versatile and have the ability to also be used as step up converters (to allow the use of UK equipment in the US). If you wish to do this, all you need to do is change the jumper switch at the back of the converter and fit an adapter to the power plug (we supply an adapter free with each Power Bright voltage converter). 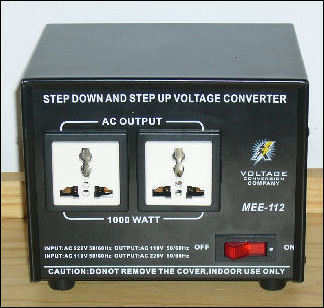 Heavy Duty Step Down and Step Up Voltage Converter (4000 Watts) Ref: MEE-116. 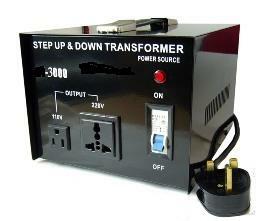 Heavy Duty Step Down and Step Up Voltage Converter (5000 Watts) Ref: MEE-117. This Andefia VT-5000 5000 Watt Step-down Voltage Converter is for use in the UK or any other 200 -240V country to power electrical equipment from the USA or Canada or any other 110-120V country. What it does is convert UK or European 200 - 240 volts to US 110 - 120 volts. The output is pure AC and the voltage converter can be used with all appliances rated 0 - 5000W. This voltage converter has to be hard wired into place and must be installed by a qualified electrician or very competent home user. 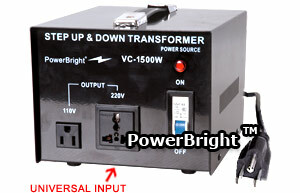 Heavy Duty Step Down and Step Up Voltage Converter (10000 Watts) Ref: ST10000. Our biggest heavy duty voltage converter, capable of powering very high wattage industrial grade equipment. Converts 220 - 240V AC mains power to 110 - 120V AC 50/60Hz. Rated up to 10000 Watts. 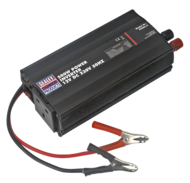  Supplies continuous smooth 230V power from 12V DC power supply found in cars, caravans, boats and HGVs.  Suitable for powering small TVs, laptops, power tools and various other electrical equipment rated under 300W (maximum under load).  Features USB port for use on various domestic electronic equipment such as digital cameras and mobile phones.  Anodized aluminium case provides durability and maximum heat dissipation.  Safety features include automatic overload shut-down and a low battery alarm to prevent damage to the supply battery.  Supplied with battery clips.  Suitable for powering small TVs, laptops, power tools and various other electrical equipment rated under 500W (maximum under load).  Suitable for powering small TVs, laptops, power tools and various other electrical equipment rated under 700W (maximum under load).  Suitable for powering small TVs, laptops, power tools and various other electrical equipment rated under 1000W (maximum under load). 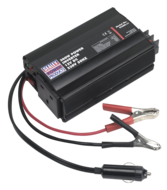  Supplied with battery terminal leads.